Francis Lyall and Paul B. Larsen have been involved in teaching and researching space law for over 50 years. This new edition of their well-received text gathers together their knowledge and experience in readable form, and covers developments in all space applications, including space tourism, telecommunications, the ITU and finance. With an extensive citation of the literature, the discussion provides an excellent source for both students and practitioners. This publication, in its second edition, covers all important legal issues in space law in the era of space commercialization and privatization. This book has a most comprehensive treatment of an increasingly important subject. It is exceptionally valuable to scholars and practitioners alike in the field of space law. 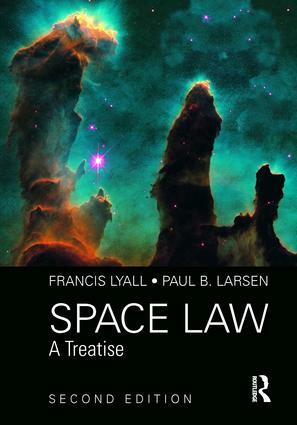 Lyall and Larsen on Space Law should be on the bookshelf of every Space Law practitioner or student. I have used the earlier edition in my Space Law classes for years. This extremely well-researched and annotated revised edition takes into account major new developments, such as the 2015 US law authorizing outer space resource extraction. The authors deliver a vibrant analysis demonstrating how much Outer Space is today permeated with sound principles of law, customary practices and pragmatic regulatory solutions. A laudable comprehensive approach, providing a wise balance of propositions and a landmark work to spread the understanding of space laws in the current times of questioning and evolution of space activities. This is a real masterpiece…. It is an all encompassing, nicely written and well researched treatise that anybody who has ever had to bring to paper something in space law can only have admiration for. If one looks through the pages and sees the immense work that is reflected in the magnificent number of footnotes one may have a slight idea of the amount of work which the authors required or needed to deliver for the second edition…As is well known Frank Lyall and Paul Larsen are masters of international space law. It is their great experience that is reflected in this work. "This is a welcome addition to Scottish literature on the relationship between church and state. … Professor Lyall's contribution takes a broader perspective, looking at the law in relation not only to the established church but also to other denominations and also discussing the relationship between religion and legal regulation in modern society." "The wealth of experience and know-how of Paul Larsen and Francis Lyall, who both spent decades perfecting their skills in space law through work in academia and practice in the UK and the USA, combined with their mastery of the written word, result in a book that will certainly become the new favourite space law book of many students, scholars and practitioners." This review will consider the efforts of the authors to provide a basic introduction to the law of outer space while comparing it to other interpretations, practice and broader literature. This approach confirms that the authors have developed a highly robust and academically rigorous text, one which sits in the enviable position of being a go-to book for a range of audiences, from the law student right through to the experienced international lawyer looking for further information on a booming discipline.